Early this year, I found myself aboard a Russian research ship, working as a chaperone for an educational programme called Students on Ice, which aims to give high-school students the opportunity to experience and understand the magic of the poles. For two weeks, we journeyed together in a place so utterly remote and distant from the comfort zones we had left behind. 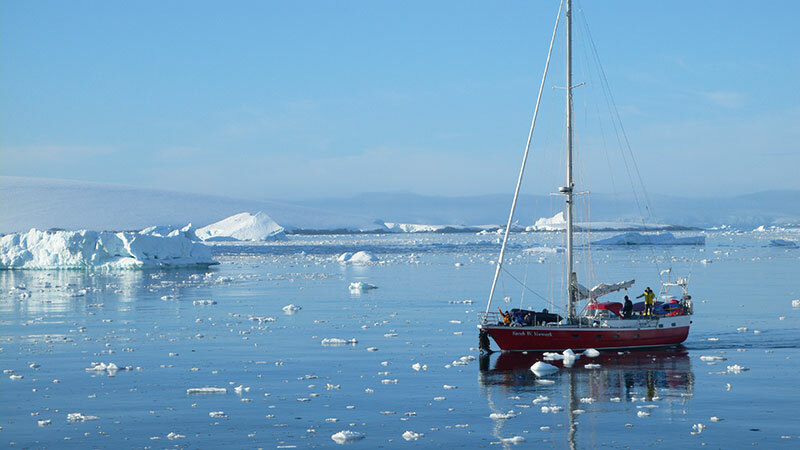 Along the way, we each picked up our own treasured pieces of wisdom, but the first lesson from the bottom of the world was a decidedly unanimous one: Antarctica, metaphorically and literally, is the most super-cool place on the planet. It is the coldest, driest, windiest, iciest continent; with the longest days and the longest nights, the least amount of soil and the greatest amount of freshwater. Ninety per cent of the earth’s total ice volume is housed in her reserves; yet, with less than two inches of precipitation a year, she is a greater, more hostile desert than the Sahara. And if all these extremes and contradictions aren’t enough, Antarctica is also separated from the rest of humanity by the stormiest body of water in the world – the Southern Ocean. One part of the Southern Ocean is particularly traumatic – the Drake Passage – a skinny 400-mile stretch between Tierra del Fuego and Antarctica, through which 130 million cubic metres of water are squeezed per second – simulating an experience of being strapped in a roller coaster for two days without being given the option to step off. The “Drake Shakes” have been tormenting seafarers for the past 200 years, ever since humans first discovered ‘terra nullus’ at the bottom of the world. Lucky for us though, the effects weren’t life-threatening. Some of us had to reach for sick-bags and sea-sickness pills, while others had to lie strapped in their beds. The more stalwart of our squad stood out on deck in the cold, biting grey air, watching as the legendary wandering albatross followed our ship like a protective talisman into calmer waters. Lesson Two: danger and delight grow on one stalk. Once we reached within sight of land, everything changed. A blinding whiteness loomed around us that seemed almost cruel, insecure; lording over us with its ice sculpture galleries emanating ethereal blue lights, and its ancient snowy mountains of indeterminable size. It was like falling through the hole to wonderland and landing up in prehistory instead: continental crust, Cordillerean folds, pre-Cambrian granite shields; trenches, rifts, plates. To get a grasp of it, you have to erase every human marker from your mind. You have to imagine a horizon which exists in the circular: 360 degrees of pure, uninterrupted eternity. And so it happened, that on the first day of the year, I found myself donning three layers of clothing, knee-high galoshes, and a ridiculous red fluffy hat, wobbling off the gangplank into a Zodiac (a sophisticated version of an inflatable dinghy), about to make my first landing in Antarctica along with 30 super-excited, hormonally-charged teenagers. I want to say, that it was here that I found a beginning. 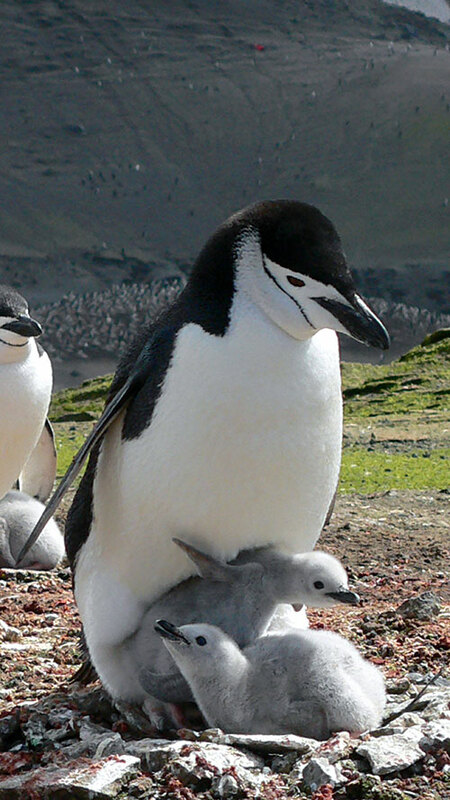 On an island with thousands of chinstrap penguins waddling up and down in thigh-high ice, and rows of moulting elephant seals wallowing and burping in black volcanic mud. Or later, at the old whaler’s station on Deception Island where whale vertebrae and skeletons of boats lay strewn in surreal disarray, reminiscent of a Dali painting. 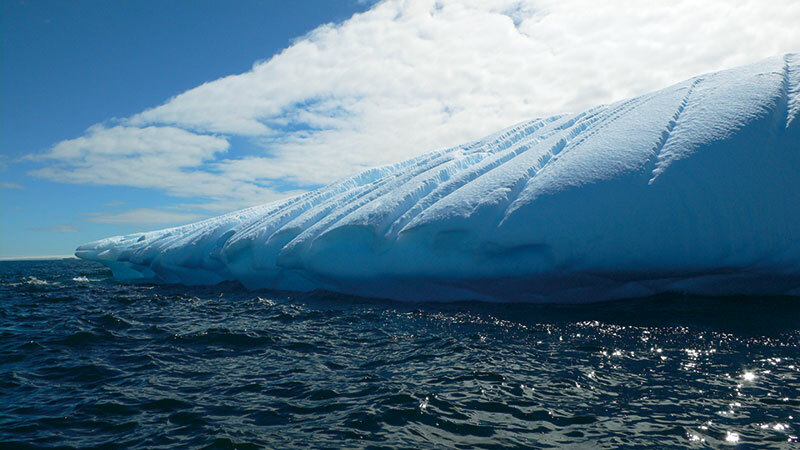 Or even later, in Paradise Bay, watching an avalanche tear clouds into an unblemished blue sky. Or following humpback whales for hours, watching them tail and fluke, fluke and tail; the glorious breadth and width of them catching the air in our throats. Or holding a piece of sedimentary rock in my palms – smooth and old and replete with fossils. The truth is that each day was something utterly different from anything I’d ever seen or experienced before. Glaciers melting, penguins gambolling, seals sunbathing. Even the simple miracle of opening the cabin window to the Antarctic’s austral summer, and letting the 24-hour sun shine through with all its cold intensity, is something that a person living 13 degrees north of the equator, cannot begin to understand. Lesson Three: the end is in the beginning and lies far ahead. Antarctica makes you think about beginnings and endings; gases coagulating, continents shifting, oceans churning, suns exploding. Perhaps because no human life has ever managed to sustain itself here. Or perhaps because it’s the only place where you can be confronted with a vision of what the world must have looked like millions of years ago. Either way, it will force you to place yourself in the global and historical scale of things; and you will undoubtedly begin to shrink. Because geologically speaking, the entire 12,000 paltry years of human civilization amounts to nothing more than a blink, a twitch, at best – a nervous tic of the eye. 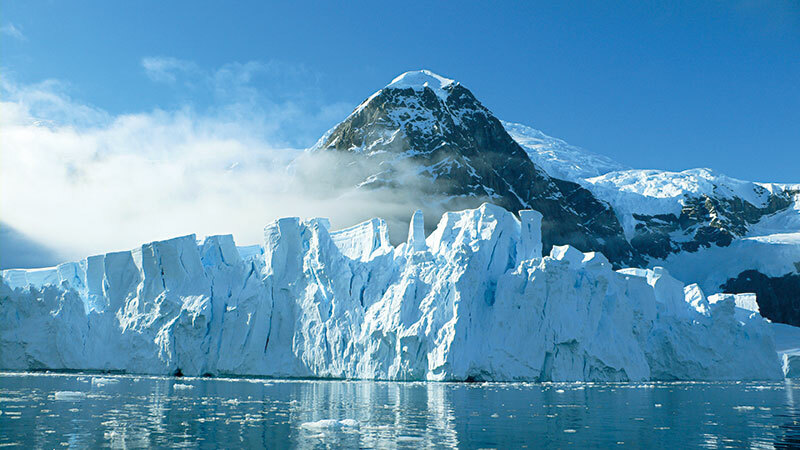 The creation of Antarctica is in itself a fairly ‘new’ geological phenomena when put in context with the 4.6 billion years our planet has been spinning around. About 650 million years ago, all the continents of the southern hemisphere were mashed together like a giant, overripe tomato, bulging across the equator, to make one giant super-continent: Gondwana. Then, gradually, about 130 million years ago, during the time of the dinosaurs, the continents were forced to separate, taking all living things with them. South America and Africa pulled westwards, Australia drifted eastward, Arabia and India pushed northward, jamming into Asia, while Antarctica got pushed down south, all the way to the solitary bottom of the world: unclaimed, unowned, unmarked. To visit Antarctica today, is to be part of that history. To understand how everything in our universe, does indeed ‘connect.’ E.M. Forster hit on this idea a long time ago; agreed. But in Antarctica, it is an inescapable revelation, one that will stay with you long after that deep blue horizon has passed out of your line of vision. Take the microscopic phytoplankton for instance – those great grasses of the sea – the basis for the entire Southern Ocean’s food chain. Phytoplankton work like chlorophyll in plants who derive energy from the sun and sustain the entire wellbeing of the forests, and ultimately, human beings. If the forests are the earth’s lungs, then the oceans are her womb. 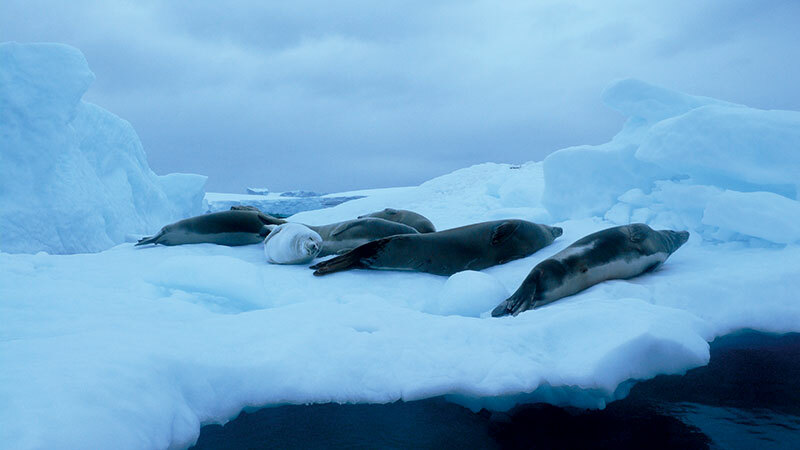 Scientists say that if the ozone layer is further depleted, it will affect phytoplankton activity, which will directly affect krill, penguins, seals and whales. In Antarctica, there is in play, a great metaphor for existence: take care of the small things and the big things will fall into place. It’s easy to think that polar ice caps melting on the other ends of the world have nothing to do with us sitting in our cities, towns, villages, mega cities, where we have etched our human history so conspicuously over Nature’s. But we are indeed connected by the winds and the oceans, by rivers and air. 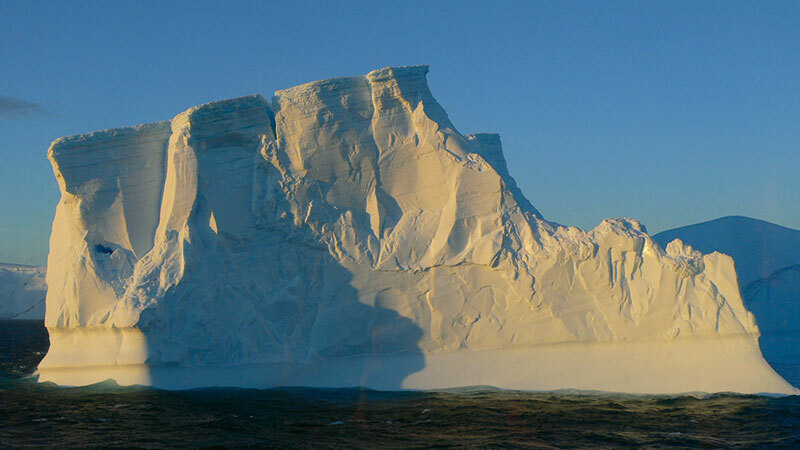 If the present Antarctic ice sheet were to melt, it would raise ocean levels by 200 feet! The oceans are the biggest, most fertile breeding grounds on the planet. If they are in danger, we are in danger. On my journey back, I made a resolution to hold on to the clarity that I’d gained from this last true bastion of Nature on earth. De-clutter, de-clutter, I muttered to myself – willing it to be the mantra for my New Year. Unmuddy your relationships; look for clarifications; save the world. Yes. Yes. Yes. But even as I slipped back into my other-worldly Chennai skin, 11,300 kilometres away, assaulted by the smell of jasmine and coconut oil, tobacco and salty air – I knew I’d already let go of that tabular glacier blue – the loving sharpness of it.